When going to your prerelease, whether its at midnight, Saturday, and/or Sunday, here are some common cards you'll want to look for and definitely use. Also, if you have your own basic land, I recommend bringing some of your own. Yes, stores have basic land available for everyone's use, but I've played in prereleases where the store has run out due to the sheer number of players (and as a result, I am so glad I bring my full art Zendikar lands with me to limited format events. Sadly I don't have them right now, I left them at home for the summer, but I have land from a deck builder's toolkit I can use at least). 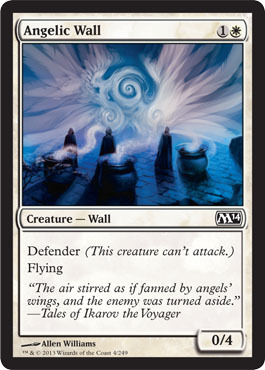 Two mana for a flying wall. This should stop most early threats and buy some time in the late game. 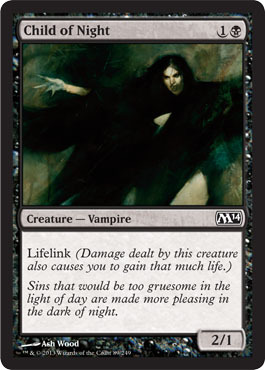 Two mana that gives a creature +1/+3 AND you gain 3 life? Perfect card for limited. Permanently pumps a creature and gives you a bonus for playing it. You either have a 1/1 creature early game, or you have something to give you one life each turn. Not the best card out there, but it fits better in Limited than Standard. 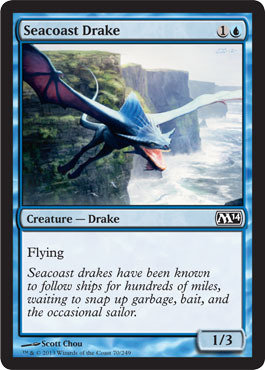 One mana for a flyer that is a 1/1. 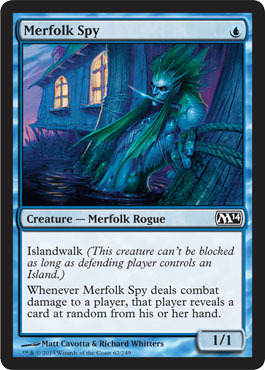 Honestly, when playing white, you can't ask for much better... People like playing control, which is blue, so having a 1/1 creature for one mana that you can attack anyone with an Island without them blocking AND letting you see some of the cards in their hand can give you an edge. 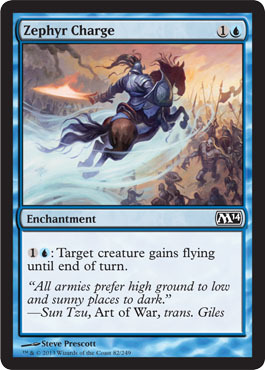 For one extra mana over Suntail Hawk, you get an extra two toughness for a flyer. But when playing blue, I recommend throwing at least one of these in. 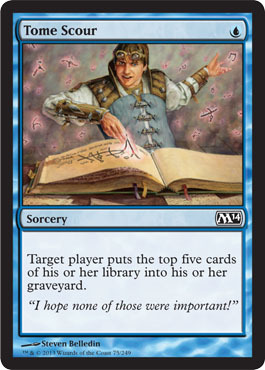 When most decks have 40 cards in limited, the loss of 5 cards can be a major detriment. Especially if you get two of these. If you play them first and second turn, your opponent will have lost 10 of their 40 cards, and will have possibly drawn 8 in all. They're down to 22 cards, and you may have taken out the land they need in the early game. 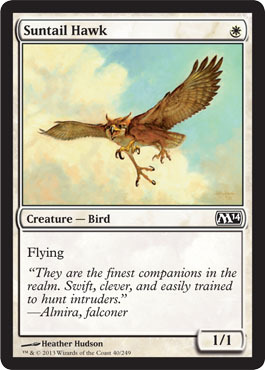 On the turn you play this, sure it costs four mana in all to give one creature flying, but after that turn, you can use the same four mana for two creatures having flying. 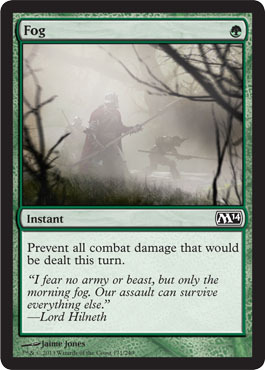 This is helpful especially when you have either plenty of mana, or you have run out of cards in your hand to play. 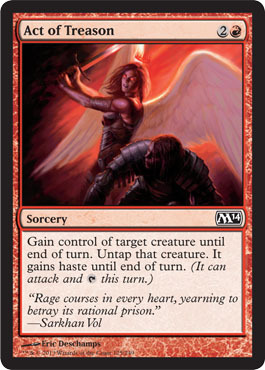 This is a classic for black decks in core sets. 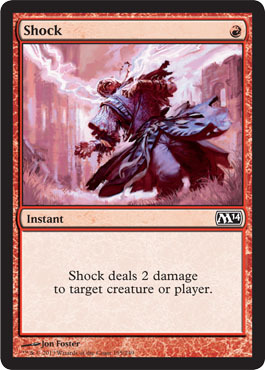 Two mana for a creature that is a 2/1 and has lifelink. Pretty useful. For two mana and one life, you can give one of your creatures +3/+1. It's pretty worth it, especially if you throw it on Child of Night. 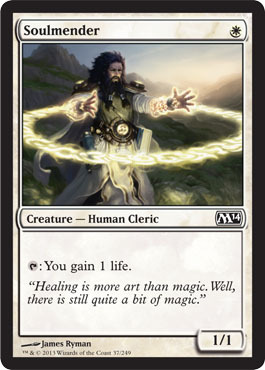 That's a good combo as you'll gain your life back... Not my favorite card, because you can't take out a creature before it's played, but then again, you could take out someone's planeswalker or some other awesome card that otherwise could cause you to lose. "A" graveyard. Doesn't have to be yours. 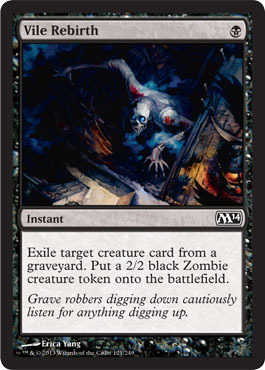 I don't remember if there are cards that return creatures from graveyards in M14, but hey, a 2/2 for one mana. Not bad. I'm a fan of stealing oppponent's creatures and slapping them with their own awesome card, so for three mana, you can take control any one of their creatures for one turn, that's just plain awesome! 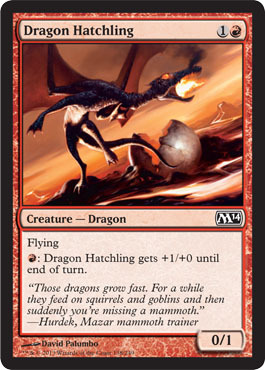 Two mana for a 0/1 with flying may seem like a poor card to use, but then the next turn, for the two mana you used to cast it, you can then use to make it a 2/1 Dragon with flying. Sure you have to pump it each turn, but really, it's pretty cool. This should be self explanatory. One mana to take out a creature that already took damage, or before it can block a creature. My favorite use is hitting my opponent for 2 on my opening turn. But then you never know when you need to take out a creature that has taken damage. 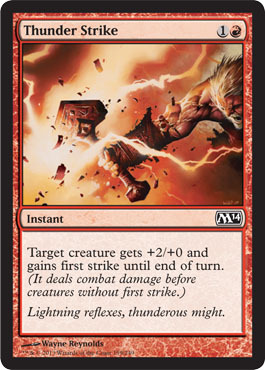 Two mana that gives a creature +2/+0 and first strike isn't too bad. Not the best pump spell, but decent for those playing red. Mana dork. When playing green, never leave home without one. Helps accelerate to those stupidly huge creatures with cool abilities so you can play them one or two turns earlier than normal. Fog is just cool. Saves yourself for one more turn. Remember, getting your opponent to go all in could be the difference of losing to them or being able to take them out on your next turn since their creatures wouldn't be able to block when you attack. I love Giant Growth, Titanic Growth, and Phytoburst. They are all pump spells that give your creature +3/+3, +4/+4 and +5/+5 respectively. 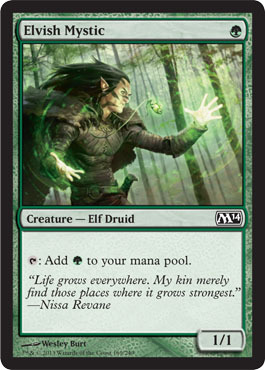 Of course, we have Giant Growth, which is only +3/+3, but hey, dropping this on a flying creature or a creature with lifelink allows you to benefit greatly. One mana for a 1/1 with hexproof. 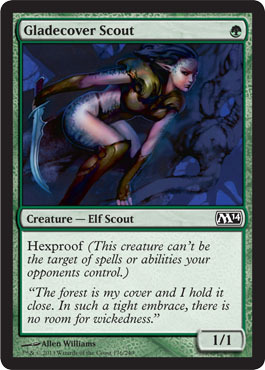 That means your opponent can't take out Gladecover Scout with a spell. 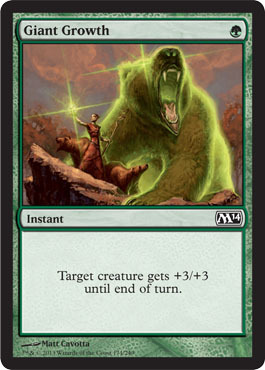 Good for putting pump spells like Giant Growth on it, as unless their creatures are huge, you'll either tear down a creature or deal a decent amount of damage to them.